In primary breast cancer metastases frequently arise from a state of dormancy that may persist for extended periods of time. We investigated the efficacy of plasma micro-RNA (miR)-21, miR-23b, miR-190, miR-200b and miR-200c, related to dormancy and metastasis, to predict the outcome of patients with early breast cancer. miRNAs were evaluated by RT-qPCR in plasma obtained before adjuvant chemotherapy. miRNA expression, classified as high or low according to median values, correlated with relapse and survival. Receiver operating characteristic (ROC) curves were constructed to determine miRNA sensitivity and specificity. miR-21 (p < 0.001), miR-23b (p = 0.028) and miR-200c (p < 0.001) expression were higher and miR-190 was lower (p = 0.013) in relapsed (n = 49), compared to non-relapsed patients (n = 84). Interestingly, miR-190 was lower (p = 0.0032) in patients with early relapse (at < 3 years; n = 23) compared to those without early relapse (n = 110). On the other hand, miR-21 and miR-200c were higher (p = 0.015 and p < 0.001, respectively) in patients with late relapse (relapse at ≥ 5 years; n = 20) as compared to non-relapsed patients. High miR-200c was associated with shorter disease-free survival (DFS) (p = 0.005) and high miR-21 with both shorter DFS and overall survival (OS) (p < 0.001 and p = 0.033, respectively) compared to low expression. ROC curve analysis revealed that miR-21, miR-23b, miR-190 and miR-200c discriminated relapsed from non-relapsed patients. A combination of of miR-21, miR-23b and miR-190 showed higher sensitivity and specificity in ROC analyses compared to each miRNA alone; accuracy was further improved by adding lymph node infiltration and tumor grade to the panel of three miRs (AUC 0.873). Furthermore, the combination of miR-200c, lymph node infiltration, tumor grade and estrogen receptor predicted late relapse (AUC 0.890). 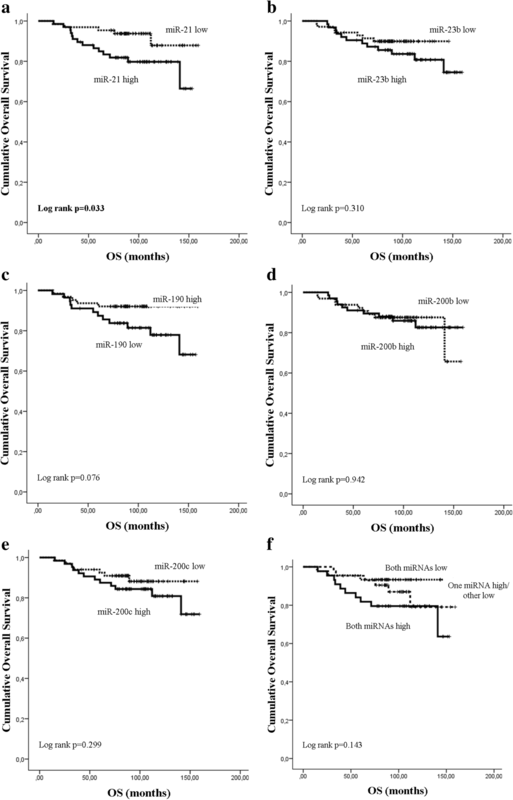 Circulating miRNAs are differentially expressed among relapsed and non-relapsed patients with early breast cancer and predict recurrence many years before its clinical detection. Our results suggest that miRNAs represent potential circulating biomarkers in early breast cancer. Despite significant advances in diagnosis and treatment of early breast cancer, almost 30% of patients will eventually have local or distant recurrence [1–3]. Recurrence is considered to result from cancer cells that persist after surgery and systemic therapy and remain in a dormant state for many years before they start proliferating and form local or distant metastases [4, 5]. Strategies to improve the management of patients with early disease should include the development of novel biomarkers for the early recognition of patients at high risk of relapse. Clinicopathological parameters are commonly used for the prediction of patients’ prognosis; however, they often lack individualized validity for the identification of patients at high risk, due to significant inter-patient heterogeneity . In addition, molecular profiling tests have been developed for prognostication but their routine clinical implementation is problematic . Furthermore, the genetic profiling of solid tumors is currently performed on biopsies that might fail to reflect intra-tumoral heterogeneity and limit the opportunity to track genetic alterations occurring during cancer evolution . Therefore, there is an unmet need to identify novel non-invasive biomarkers for the better prediction of the risk of recurrence in breast cancer. MicroRNAs (miRNAs), a large family of small (20–22 nucleotides) non-coding RNAs, regulate approximately 30% of the genes in the human genome at the post-transcriptional level, by binding to the complementary sequences of the 3′- untranslated region (3’-UTR) of their target messenger RNAs (mRNAs), leading to either mRNA degradation or inhibition of protein translation . miRNAs are deregulated in cancer, acting as both oncogenes and tumor suppressor genes . The altered expression of miRNAs has been associated with poor clinical outcome in patients diagnosed with a variety of tumors . In the past decade miRNAs have emerged as promising biomarkers in breast cancer and have been increasingly identified in biological fluids such as serum or plasma as circulating miRNAs . Circulating miRNAs are significantly stable in biological fluids [13, 14] and could potentially serve as a “liquid biopsy” for the real-time evaluation of tumor status. The assessment of dormancy and metastasis-related miRNAs could be of importance for the identification of patients at high risk of relapse. The mechanisms that lead to dormancy or enable the formation of metastases remain poorly understood. Data from in vitro models or expression analysis in patients with breast cancer suggest that miR-21, miR-23b, miR-190 and the miR-200 family members, such as miR-200b and miR-200c, are important in cancer dormancy and metastasis. An epithelial to mesenchymal transition (EMT)-related gene signature in the primary tumor has been associated with both stromal activation and escape from dormancy in breast cancer , suggesting that intrinsic EMT features may regulate the transition of disseminated tumor cells into a dormant phenotype with the ability to outgrow as recurrent disease. In another report, the activation of the EMT program, as orchestrated by the key regulator of EMT, Zeb1, was sufficient to promote escape from latency and stimulate the development of metastases . The miR-200 family regulates EMT by targeting the ZEB1/2-E-cadherin axis , whereas in other studies, elevated levels of miR-200 family have induced EMT and promoted metastasis in breast cancer . Several lines of evidence suggest that miR-21 is oncogenic in various types of cancer by suppressing several apoptotic and tumor suppressor genes  and by inducing cell proliferation, migration, invasion and metastasis. miR-23b has been shown to promote tumor dormancy in the metastatic niche , whereas miR-190 upregulation has been associated with prolonged tumor dormancy in fast-growing tumors such as osteosarcomas and glioblastomas . Based on the above, the aim of the present study was to investigate the expression of miR-21, miR-23b, miR-190, miR-200b and miR-200c in the plasma of patients with early breast cancer and evaluate their role in the prediction of patients’ outcomes. A total of 209 consecutive patients with early breast cancer who underwent surgery followed by adjuvant chemotherapy administered at the Department of Medical Oncology of the University Hospital of Heraklion (Crete, Greece) between years 2003 and 2010 and had available plasma samples, were included in the present study. Plasma samples were obtained after the surgical resection of the primary tumor and before the initiation of adjuvant chemotherapy. Plasma samples were also collected from 23 normal blood donors to serve as controls. All patients and normal donors had provided signed informed consent to participate in the study, which was approved by the Ethics and Scientific Committee of Department of Medical Oncology of the University Hospital of Heraklion (ID 13998/8–10-2104; Crete, Greece). Clinical characteristics and follow-up information for each patient were prospectively collected. Peripheral blood from healthy donors and patients was drawn early in the morning and was collected in EDTA tubes. Plasma was subsequently isolated within 2 h by centrifugation at 2500 rpm for 15 min at 4 °C, followed by a second centrifugation at 2000 g for 15 min at 4 °C to remove cellular debris. Samples were kept in aliquots at ˗ 80 °C until further use. Plasma samples presenting a change in color to pink, suggesting the presence of hemolysis, were not processed for further analysis (Fig. 1). Plasma samples were thawed on ice and centrifuged at 10000 rpm for 10 min in order to remove cellular debris. Total RNA was extracted from 400 μl of plasma using Trizol LS (Ambion, Life Technologies). After denaturation, 5 μl containing 25 fmoles of a synthetic Caenorhabditis elegans miRNA cel-miR-39 (Qiagen Inc., USA) was added to each sample as an endogenous control to allow for normalization of sample-to-sample variation. Aqueous phase was separated from organic phase by adding 250 μl chloroform followed by incubation on ice for 10 min. After centrifugation, an equal volume of 700 μl of supernatant, from each sample, was transferred to an Eppendorf tube. Then, RNA was precipitated by adding 0.7 volumes of isopropanol and 1 μl glycogen followed by incubation at ˗ 80 °C, overnight. On the next day, and after centrifugation, RNA pellet was washed three times with 75% ethanol, air dried and finally resuspended in 50 μl RNAse-free water. RNA from all samples was kept in aliquots at ˗ 80 °C until further use in the subsequent real-time qPCR. Reverse transcription and RT-qPCR was performed according to manufacturer’s instructions and as previously described . Total RNA input of 1.67 μl was reverse transcribed using the TaqMan miRNA Reverse Transcription kit and miRNA specific stem-loop primers (Applied Biosystmes, Foster City, CA, USA) in a 5-μl reaction comprising 1 mM dNTPs, 1 × PCR Reverse Transcription Buffer, 0.787 μl H2O, 3.3 units Multiscribe Reverse Transcriptase, 0.252 units RNase inhibitors and 0.2 × RT-specific stem-loop primers. The reaction was performed in a Peltier Thermal Cycler PTC-200 at 16 °C for 30 min, 42 °C for 30 min and 85 °C for 5 min. Complementary DNA (cDNA) was diluted at 30 μl and each miRNA was assessed by RT-qPCR in a 5-μl reaction comprising 1 × of TaqMan 2× Universal PCR Mater Mix, No AmpErase UNG, 0.25 μl of TaqMan miRNA Assay and 2.25 μl of diluted cDNA. The quantitative real- time PCR reaction was carried out at 95 °C for 10 min, followed by 40 cycles of 95 °C for 15 min and 60 °C for 1 min on a ViiA 7 Real-Time PCR System (Applied Biosystems, Foster City, CA, USA). All the assays were performed in triplicates. Appropriate negative controls were used in both cDNA synthesis and RT-qPCR reactions where RNA input was replaced by H2O and no template control was used, respectively. The average expression levels for each miRNA were calculated by the 2-ΔCt method relative to the average of miR-23a. Due to the lack of consensus concerning the normalization of circulating miRNAs we used miR-23a as a reference gene that was stably and reproducibly expressed among patients’ groups (Mann-Whitney test, p = 0.458) and among patients and normal donors (Mann-Whitney test, p = 0.12) . Finally, the fold change in target miRNAs relative to miRNAs expressed in normal controls was calculated by the 2-ΔΔCt method . Samples with mean cycle threshold (Ct) > 35 for target miRNAs (n = 17) were excluded from the analysis. In addition, samples with mean Ct > 22 or Ct < 20 of cel-miR-39 (n = 5), suggesting RNA extraction was not efficient, were also excluded. Moreover, plasma samples were tested for contamination with red blood cells by measuring miR-451 and miR-23a expression levels . Samples contaminated with red blood cells were not processed for further analysis. The statistical analysis was performed using the SPSS software package, version 22.0 (SPSS Inc. Chicago IL, USA). Cutoff points were set at the median value for expression of each miRNA. Patients with miRNA expression above or equal to the median values were characterized as having high expression, whereas patients with miRNA expression below the median were characterized as having low expression. Spearman’s test was used to test correlation between expression of the different miRNAs. 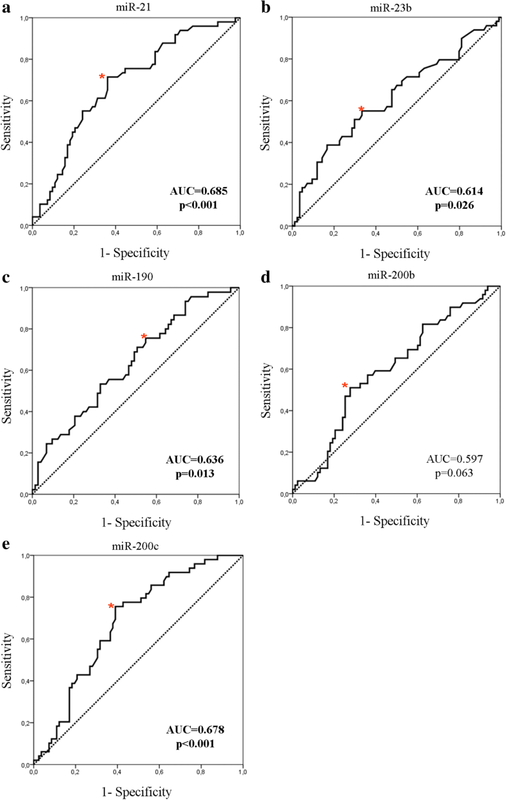 The Mann-Whitney U-test and Kruskal Wallis test were used to estimate associations between miRNA expression and clinicopathological characteristics. Differences in clinicopathological characteristics between relapsed and non-relapsed patients were evaluated by Pearson’s chi-square test. The associations between circulating miRNA expression levels and disease-free survival (DFS) or overall survival (OS) were assessed by the Kaplan-Meier method, log rank test (Mantel-Cox) and Cox proportional hazard regression models. DFS was calculated from the date of surgery until the date of relapse or death from any cause, whereas OS was calculated from the date of surgery until the date of death from any cause or last follow up. The Mann-Whitney test was used to examine the differential expression between the different groups of patients. To evaluate the value of circulating miRNAs in predicting relapse, receiver operating characteristics (ROC) curves were constructed and area under the curve (AUC) calculated. The Youden index (sensitivity + specificity – 1) was used to set the optimal cutoff point. Logistic regression analyses were performed to identify the best discriminating combinations of miRNAs with clinicopathological features. Cross-validation analysis was implemented in R using a generalized linear model for logistic regression, with recurrence/non-relapse as binary target variables (http://www.r-project.org/). Statistical significance was set at p < 0.05 (two-sided test). This report is written according to the reporting recommendations for tumor marker prognostic studies (REMARK criteria) . The flow diagram of the study and patients’ characteristics are summarized in Fig. 1 and Table 1, respectively. Plasma samples from 155 patients with early breast cancer and from 23 healthy women were processed for RNA extraction. There were 22 patients excluded from the analysis as described above. After a median follow-up period of 94.3 months (range 14.33–159.30), 84 out of the 133 patients with breast cancer who were included in the analysis remained disease-free and 49 had relapsed. Demographics and clinical characteristics were similar between patients who remained disease-free and those who developed recurrence, except for the proportions of patients with tumor size of > 5 cm (T3) and four or more infiltrated axillary lymph nodes, which were higher in patients who had recurrence (p = 0.015 and p = 0.003, respectively; Table 1). Patients were divided into three groups according to the clinical outcome: (i) patients who remained disease-free during the whole follow-up period (n = 84), (ii) patients with early relapse, defined as relapse within 3 years post-surgery (< 3 years; n = 23) and (iii) patients with late relapse, defined as relapse presenting at 5 years or more post-surgery (≥ 5 years; n = 20). Consequently, 6 out of 49 relapses were observed in between 3 and 5 years. Patients’ characteristics for the groups (ii) and (iii) are shown in Table 2. The median age was 52, 55 and 53 years in each group, respectively. No significant associations were observed between miRNA expression (high expression, low expression) and age, menopausal status, tumor size, histological grade, number of infiltrated lymph nodes, estrogen receptor (ER), progesterone receptor (PR) or human epidermal growth factor receptor 2 (HER2) status (chi-square test, p > 0.05). However, miR-21 expression was higher in PR-negative as compared to PR-positive patients (63.4% vs 36.6%; chi-square test, p = 0.038). As expected, there was strong correlation between expression of miR-200b and miR-200c (Spearman’s Rho 0.628; p < 0.001) that belong to the same miR-200 family. Moreover, there was strong correlation between miR-21 and miR-200b (Spearman’s Rho 0.447; p < 0.001) and miR-200c (Spearman’s Rho 0.540; p < 0.001) expression, as well. Weaker but still significant association was observed between the dormancy-related miR-23b and miR-190 (Spearman’s Rho 0.236; p < 0.001) (Table 3). Median expression levels of miR-21, miR-23b and miR-200c were significantly higher (p < 0.001, p = 0.028 and p < 0.001, respectively) and median miR-190 expression was significantly lower (p = 0.013) in relapsed compared to non-relapsed patients (Fig. 2). No significant difference was observed in the median expression of miR-200b (p = 0.063) between the two groups. Subsequently, we evaluated the DFS (Fig. 3) and OS (Fig. 4) in patients classified into high and low expression groups, according to the median value of each miRNA. We found that patients with high miR-21 expression had significantly shorter DFS compared to patients with low expression (105.03 months versus not reached; p < 0.001) (Fig. 3a). Similarly, patients with high miR-200c expression had significantly shorter DFS compared to those with low miR-200c (105.03 vs not reached; p = 0.005) (Fig. 3e). Finally, patients with high expression of both miR-21 and miR-200c had shorter DFS compared to patients with only one miRNA high or with both low (81.37 vs 132.9 and not reached, respectively; p < 0.001) (Fig. 3f). No significant differences in DFS were found among patients with high or low expression of miR-23b, miR-190 or miR-200b (Fig. 3b-d). Median survival was not reached by patients with either high or low expression of any of the miRNAs evaluated (Fig. 4b-e). Nevertheless, only patients with high miR-21 had significantly shorter OS compared to those with low miR-21 (p = 0.033) (Fig. 4a). To evaluate further the prognostic value of the circulating miRNAs, univariate and multivariate analyses were performed that included demographic and clinical variables and the expression levels of the five miRNAs (classified into high or low). Cox univariate analysis revealed that patients with infiltrated axillary lymph nodes and those with negative hormone receptor expression had significantly shorter DFS (p = 0.013 and p = 0.028, respectively) and OS (p = 0.044 and p = 0.01, respectively) (Table 4). High miR-21 and miR-200c expression levels were significantly associated with shorter DFS (p < 0.001 and p = 0.007, respectively) and only miR-21 high expression was associated with shorter OS (p = 0.042) (Table 4). Cox multivariate analysis revealed that the involvement of axillary lymph nodes and hormone receptor negativity were independent prognostic factors for shorter DFS (p = 0.019 and p = 0.012, respectively) and OS (p = 0.029 and p = 0.006, respectively) (Table 4). 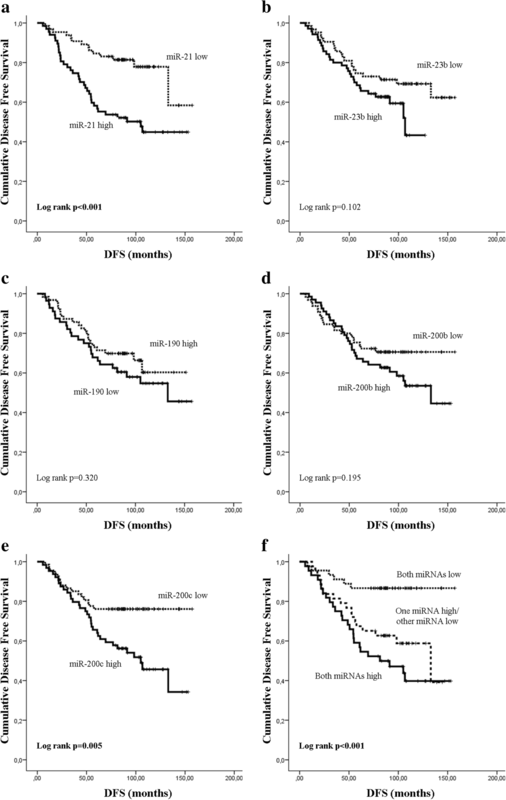 Furthermore, only high miR-21 and high miR-200c expression emerged as independent prognostic factors associated with shorter DFS (p = 0.003 and p = 0.037) (Table 4). We examined further whether the five circulating miRNAs are differentially expressed among patients classified into groups according to the timing of recurrence. For this purpose we compared miRNA expression levels in (i) patients who relapsed early compared to those who did not experience early relapse i.e. in patients who had recurrence within 3 years (n = 23) and those who either relapsed 3 or more years post-surgery or remained disease-free for the whole follow-up period (n = 110) and (ii) in patients with late relapse (at ≥ 5 years; n = 20) compared to those who remained disease-free during the whole follow-up period (n = 84). The Mann-Whitney test revealed that miR-190 expression levels were lower in patients with early relapse (p = 0.0032), whereas no differences were recorded for the remaining miRNAs (Fig. 5). Moreover, miR-21 and miR-200c expression was higher in patients with late relapse as compared to non-relapsed patients (p = 0.015 and p < 0.001, respectively; Fig. 6a and e). Expression levels of various miRNAs were combined with clinicopathological characteristics in relapse-predicting models. We used binary logistic regression incorporating various combinations of miRNAs and used the corresponding ROC curves to determine the sensitivity and the specificity of plasma miRNA expression, to discriminate patients who subsequently had disease recurrence from non-relapsed patients (Fig. 7 and Table 5). When assessing single miRNAs, the ROC curves showed that the expression of miR-21 and miR-200c had the highest performance with an area under the ROC curve (AUC) of 0.685 (sensitivity 71.4%, specificity 63.9% (p < 0.001; 95% CI 0.592–0.777)) and AUC of 0.678 (sensitivity 75.5%, specificity 61% (p < 0.001; 95% CI 0.586–0.769)), respectively (Fig. 7a and e, respectively and Table 5). When assessing combinations of miRNAs, binary logistic regression analysis resulted in a pattern of three miRNAs (miR-21, miR-23b and miR-190) bearing the highest predictive accuracy. The AUC from ROC analysis of this combined model 0.765, with sensitivity 80% and specificity 65.3% (p < 0.001; 95% CI 0.673–0.850) (Fig. 8a and Table 5). Eventually, the combination of the three miRNAs with the currently used clinical prognostic parameters, axillary lymph node infiltration and tumor grade, resulted in superior discriminatory capability (AUC 0.873, sensitivity 89% and specificity 76.2% (p < 0.001; 95% CI 0.802–0.940)) compared to the expression of the three miRNAs alone or to the clinicopathological features alone (Fig. 8b, c and Table 5). 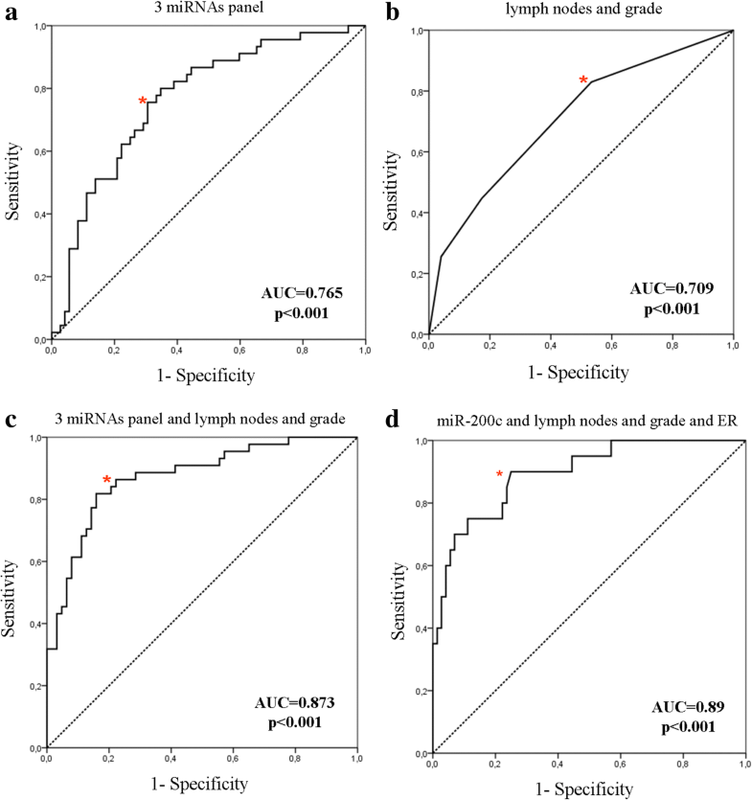 Using the same procedure the combination of miR-200c expression, axillary lymph node infiltration, tumor grade and ER status resulted in an increased AUC of 0.890 with a sensitivity 75% and specificity 89% (p < 0.001; 95% CI 0.818–0.972) for the prediction of late disease relapse (Fig. 8d and Table 5). When the same model was fitted to predict early relapse, there were no differences in the discriminatory power when combining miRNAs with clinicopathological parameters. The robustness of the predictive performance of our models was assessed through a cross-validation strategy. A 10-fold cross-validation with a 70–30 split (70% training data, 30% testing data) was implemented in R and applied on nine different feature combinations of miRNAs and clinicopathological features. Mean AUC values were calculated for each 10-fold cross-validation. The mean AUC was then compared to the AUC calculated from our initial regression analysis. There were no significant differences in the values of AUC in any variable combinations, indicating that the performance of these models is robust and can be generalized to independent datasets (Additional file 1: Table S1). An important area in current breast cancer research is the identification of novel biomarkers for the prediction of outcome in patients with early disease. In the present study we investigated the predictive capacity of the dormancy and metastasis-related miR-21, miR-23b, miR-190, miR-200b and miR-200c when determined in the plasma of patients with early breast cancer. We found that miR-21, miR-23b, miR-190 and miR-200c, evaluated before the initiation of adjuvant therapy, were differentially expressed among patients who subsequently experienced disease recurrence, compared to patients who did not relapse. High expression of miR-21 and miR-200c was associated with shorter DFS compared to patients with low expression, whereas high miR-21 was also associated with shorter OS. Interestingly, miR-21, miR-23b, miR-190 and miR-200c discriminated patients who relapsed from non-relapsed patients. The combination of miR-21, miR-23b and miR-190 in ROC curve analyses had higher sensitivity and specificity compared to each miRNA alone; accuracy was further improved by adding lymph node infiltration and tumor grade to the panel of three miRNAs. Furthermore, the combination of miR-200c, lymph node infiltration, tumor grade and ER status predicted late relapse. In breast cancer, clinically detectable metastases emerge after a period of dormancy and can last for varying and frequently prolonged periods of time. As miRNAs regulate tumor progression and metastasis we hypothesized that dormant tumors could be distinguished from faster-growing tumors by the differential expression of miRNAs . We show for the first time that miR-190 expression was lower in patients with early relapse, suggesting a potential role for this miRNA in sustaining tumor dormancy in breast cancer. Indeed, miR-190 was among the most upregulated miRNAs in a dormancy-related miRNA signature . miR-190 is involved in the regulation of the transforming growth factor (TGF)β pathway and in breast cancer TGFβ has been shown to promote bone and lung metastases [27, 28]. Thus, miR-190 could induce tumor dormancy through the modulation of TGFβ signaling . Previous studies showed that miR-23b induced dormant phenotypes in a bone marrow, metastatic, human breast cancer cell line, induced cell cycle arrest in glioma cancer stem cells and suppressed glioma cell migration and invasion [20, 30, 31] . On the contrary, the miR-23b/27b/24 cluster correlated with increased metastatic potential in human breast cancer cell lines and was upregulated in lung metastases from breast cancer . Moreover, high miR-23b/27b/24 expression was associated with poor outcome in breast cancer . Our results demonstrate higher plasma miR-23b expression in patients who relapsed, indicating that it is more likely associated with the development of metastases in breast cancer. Interestingly, the mature sequence of miR-23a differs by just one nucleotide in comparison to its paralog miR-23b, therefore they could share the same putative target genes and similar biological functions. However, there are reports showing distinct function between miR-23a and miR-23b and in contrast to miR-23b, we detected no variations in miR-23a expression levels among the different patient cohorts [34, 35]. Various preclinical studies have established that miR-21 is involved in tumor growth, invasion and migration, extracellular matrix modification and survival . In primary breast cancer, miR-21 expression is associated with tumor progression, advanced clinical stage, lymph node metastasis and poor patient outcome [37, 38]. In support of the tumor-promoting role of miR-21, serum miR-21 distinguishes patients with breast cancer from healthy controls and patients with distant metastasis from those with locoregional disease, and it is associated with poor prognosis in breast cancer [36, 39, 40]. Accordingly, we show that high circulating miR-21 discriminated between patients with early breast cancer who relapsed and those who remained disease-free and specifically, high expression was associated with late relapse. Importantly, patients with high plasma miR-21 expression levels had worse DFS and OS compared to patients with low expression, whereas high miR-21 also emerged as an independent predictive factor for shorter DFS (p = 0.003). Iorio et al., demonstrated that the TGFβ gene was a target for miR-21 and Yan et al. showed that TGFβ1 and the receptor TGFβR2 were identified among the putative target genes of miR-21 [37, 38]. These data suggest that the tumor promoting effects of miR-21 in breast cancer, could be exerted through the regulation of TGFβ signaling. The miR-200 family (miR-200a, miR-200b, miR-200c, miR-141 and miR-429) has opposing roles in the regulation of EMT and metastasis . On one hand, they negatively regulate the E-cadherin transcriptional repressors ZEB1/2 preventing EMT and on the other, they have been associated with global shifts in gene expression which promote metastatic colonization in breast cancer mouse models [17, 42]. Conflicting results have been also reported on the clinical relevance of miR-200 family members in breast cancer [43, 44]. By adopting a global profiling approach, Madhavan et al. showed that miR-200b and miR-200c were among the panel of six miRNAs with significantly increased expression in patients with early breast cancer who developed metastases . Our results also support the association between the plasma miR-200 family and metastatic progression in breast cancer. Importantly, high miR-200c was associated with late relapse and emerged as an independent prognostic factor for worse DFS (p = 0.037). ROC curve analysis confirmed the value of the plasma miRNAs in the prediction of disease recurrence in breast cancer. The combination of miR-21, miR-23b and miR-190 had higher accuracy compared to each miRNA alone. Moreover, the addition of common clinicopathological prognostic factors further improved the discriminatory capability of the three miRNAs. These results provide novel opportunities for breast cancer therapeutics employing the aforementioned miRNAs in a combinatorial miRNA approach . From a network analysis perspective, further insights might be achieved through the incorporation of information on the expression of the protein-coding mRNA associated to the involved miRNA. The formulation of a model of intervention efficiency based on a combination of miRNA, their gene targets and associated pathways would thus provide complementary information orthogonal to the one obtained from pathological characteristics. In breast cancer, late relapses are common and impose considerable concern among disease-free patients, and there are no accurate tools to identify patients at risk. Importantly, in our study miR-200c expression combined with the clinical information on axillary lymph node status, tumor grade and ER status yielded an AUC of 0.89 with sensitivity of 75% and specificity of 89% for the prediction of late relapse (p < 0.001). Our study is among the first to demonstrate the potential of metastasis-promoting miRNAs to serve as circulating predictive markers in early breast cancer. 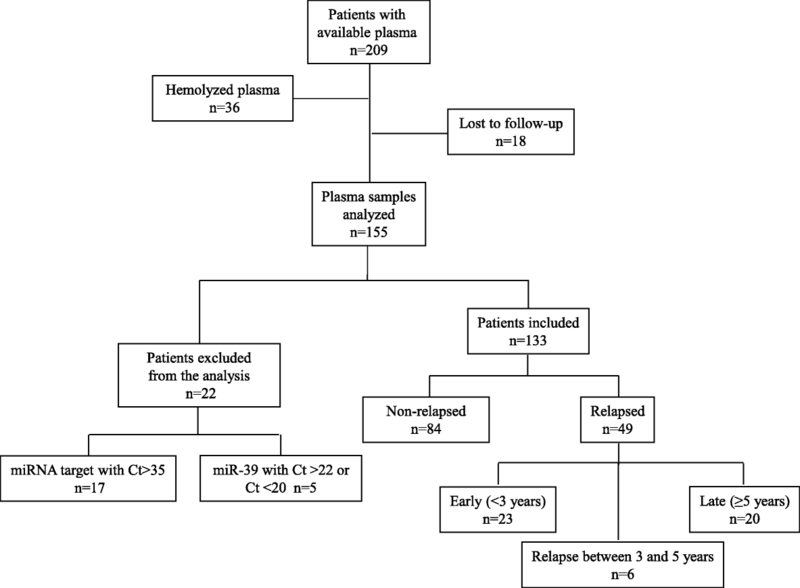 Importantly, (a) this patient cohort had long-term follow up, (b) plasma samples and clinical information were obtained prospectively, (c) the prediction of relapse was possible years before metastasis emerged and (d) circulating miRNAs added independent predictive value to common clinicopathological parameters. Furthermore, we considered pre-analytical and analytical parameters very carefully, taking into account the variables that could lead to bias in miRNA quantification [22, 47]. Limitations of our study include that results are derived from the analysis of a relatively small group of patients and lack validation in an independent cohort. However, by performing cross-validation analysis of our data , the predictive performance of the aforementioned miRNAs was confirmed, therefore it could probably be verified in an independent dataset. Nevertheless, our results should be viewed as preliminary and warrant prospective validation in a larger cohort of patients with early disease. Our results suggest that dormancy and metastasis-related miRNAs are differentially expressed in plasma in patients with early breast cancer who experience disease recurrence and in those that will remain disease-free. The identified miRNAs might be of potential use in the development of a multimarker blood-based test to complement and improve prognostication based on clinicopathological characteristics. Furthermore, these results imply that circulating miRNAs could serve as novel surrogate markers for the presence of occult micro metastatic disease and for increased risk of recurrence in early breast cancer. Finally, they provide potential insights into the procedures and pathways involved in the regulation of dormancy and metastasis in breast cancer. Chara Papadaki and Michalis Stratigos contributed equally to this work. We are grateful to all patients and volunteers who signed the consent form. This work was partly supported by Hellenic Society of Medical Oncology (HESMO). Michalis Stratigos is a recipient of a HESMO research fellowship. Work was also partly supported by the Anticancer Research Support Association (ARSA). The funders had no role in study design, data collection and analysis, decision to publish and preparation of the manuscript. All data analyzed in the current study are available from the corresponding author on reasonable request. CP coordinated the work, performed control experiments and molecular analysis, analyzed the data, interpreted the results and drafted the manuscript. MS collected the patients’ clinicopathological data, participated in data acquisition and interpretation and was involved in drafting the manuscript GM provided support in statistical analysis and data interpretation MS was involved in study design and participated in laboratory work. GM participated in laboratory work. CN provided support in statistical analysis and was involved in drafting the revised manuscript. DM was involved in study design and data interpretation, participated in the preparation of the manuscript and provided general support SA designed, coordinated and supervised the study, was involved in data analysis and interpretation and drafted the manuscript. All authors have read and approved the final manuscript. All patients and normal donors provided signed informed consent to allow research assays to be carried on their blood samples. The study was approved by the Ethics and Scientific Committee of the Department of Medical Oncology of the University Hospital of Heraklion (ID 13998/8–10-2104; Crete, Greece).